There are several ways to implement our solution. 1) You can offer it in parallel to your existing mechanisms, where those who have the required hardware can download the iOS App and data prior to coming to the meeting. Or using login credentials you provide, attendees can use their own mobile device's web browsers to access our Web Server prior, during and after the event. This enhances the individual experience of those with mobile devices, and maintains the experience of the remainder to the level of previous meeting. 2) Hybrid models also make sense for many kinds of meetings. For instance, you would not hand out iPods to all attendees at a film festival but for the core professionals there to do business in selling films you might. The added value of guaranteed availability of Conference Companion multi-media content could make all the difference in the world for closing deals. For the remaining filmgoers, it is estimated that over 60% of the general population who attend film festivals already own a smartphone. Let your attendees have the best possible festival experience by providing access to your meeting content prior to attending the event. A) Raise the registration fee? Increased cost is often absorbed unnoticed by an attendees’ employers, while attendees are impressed with using Conference Companion on a device they can keep after the meeting. B) Charge more for advertising? Just because we eliminate the printed program does not mean you should lose the revenue from sponsors, exhibitors and advertisers the printed program generated. 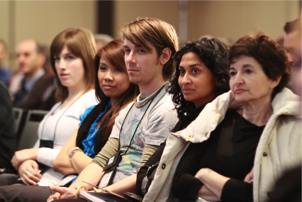 Conference Companion provide a rich environment for you to deliver value to those revenue sources. With current paper based programs, if an advertisement is placed beside the Tuesday Schedule, when Wednesday rolls around that ad is rarely seen again. Our on-screen advertisements are rotated over the entire duration of the conference. These same ads can link to rich multimedia documents and videos stored on the device, or on the internet, permitting the attendee to "peel the onion" to whatever detail they desire. This approach has ads seen more as a context sensitive service than a necessary evil. Stop printing the program, but leave nothing on the table. Advertisers see the real value in this new medium and are willing to pay more, especially if you decide to continue to update the conference data over the course of the year, driving continued views of ads. C) Charge for access to your data. The App can be made available on the Apple store for anyone who wants it. You are in control as to whether you charge for the application, or give it away. You also decide whether to charge for the privilege of access to data about your meeting, requiring an account (emailed upon registration) or allowing free access to all. Mass printing of programs, presentations, maps, and advertising are no longer required. F) Stop Warehousing Preprinted Materials. No paper, no warehousing. Save your money on storage and insurance. Show programs and supporting materials are bulky, heavy and expensive to get to the right place on the show floor. That expense is gone now. You rarely know exactly how many will attend your event, so you print more than you think you need because the cost to your reputation of running out just isn’t worth it. No more filling dumps with unused materials. Exhibitors used to hand out full color brochures. With their new multi-media documents preloaded on all attendee devices, distribution rates climb to 100%, far better than any paper handouts. All the savings above for meeting organizers also apply to exhibitors in reducing their workload and costs. K) Your exhibitors need not hand out CDs or Memory Sticks. All multimedia content can be delivered and displayed on the attendee devices, including web content, documents, presentations video form your speakers and exhibitors. Conference Companion supports Microsoft Office, Adobe Acrobat, html, and other common file formats. Exhibitor handouts are no longer required as all multimedia is preloaded on the handheld device with updates during the conference being simple. Empower presenters to make last-minute improvements to their presentations based on what they heard at your meeting, without adding cost to your organization. > How do you fund it?